Alaskan Leader Seafoods, the most progressive, innovative and vertically integrated “Hook & Line“ fishing company in Alaska took home first prize twice at the 25th Alaska Symphony of Seafood event. "We are excited to shine a bright light on Alaska Seafood and the industry that we all work together in,” said Keith Singleton, president of the value added division for Alaskan Leader Seafoods. Alaskan Leader Seafoods, the most progressive, innovative and vertically integrated “Hook & Line“ fishing company in Alaska took home first prize twice at the 25th Alaska Symphony of Seafood event. The competition held by The Alaska Fisheries Development Foundation (AFDF) enlists chefs and industry experts to pick the best new seafood products each year. Alaskan Leader Seafoods won the 2018 Symphony of Seafood's "Best in Retail" for its Lemon Herb Butter Marinated Cod along with "Best in Beyond the Plate" for its Cod Crunchies pet treats. “At Alaskan Leader Seafoods it is easy to highlight the strengths of individuals in each department, but it is when we all come together as a Team, we win. The Symphony of Seafoods awards epitomizes what we know as creative work leads to great results. We are excited to shine a bright light on Alaska Seafood and the industry that we all work together in,” said Keith Singleton, president of the value added division for Alaskan Leader Seafoods. The Alaska Symphony of Seafood is a competition for new value-added products made from Alaska seafood. The overall goal is to inspire innovative ways to fully utilize and increase the value of Alaska’s seafood. Each product entered in the competition was grouped into one of four categories: Retail, Foodservice, Beyond the Plate and Beyond the Egg. The judges tasted, deliberated, and scored all of the products. Evaluations were based on the products’ packaging and presentation, overall eating experience, price and potential for commercial success. The Premium Wild Caught Alaska Cod in Lemon Herb Butter marinade is sold in 6 portions/2.25 lb. boxes and in 12 oz. bags at club stores and various retail stores. The Wild Alaskan Cod Crunchies Fish Treats for Dogs are sold in 2x6oz bags in retail stores. Several factors set Alaskan Leader Seafoods apart from other providers with its custom designed fleet, its ability to access the best fishing grounds, and its commitment to employing the “Hook and Line” catch method. All this makes Alaskan Leader Seafoods the worlds most reliable, sustainable, and progressive fishing company producing Alaska cod products. 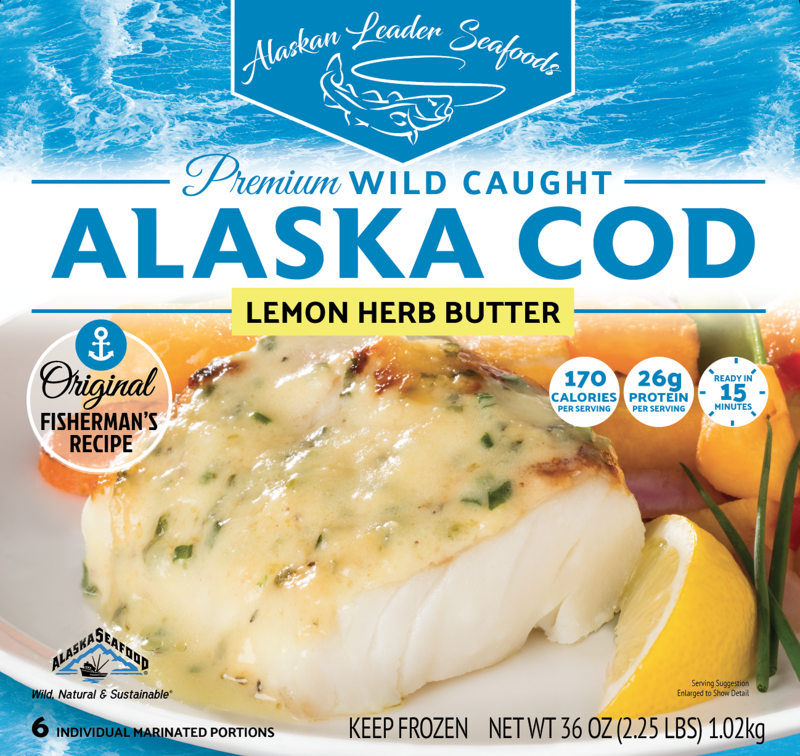 Alaskan Leader Seafoods sells wild, hook-and-line caught Alaskan cod in the United States, Asia, and Europe under the Alaskan Leader Seafoods brand name. The products are sold as frozen H&G, IQF fillets, vacuum-sealed portions, natural portions, and fish & chip portions. It also sells other parts of the cod to the pet food industry as well as to the fitness and wellness marketplace. For more information about the Alaska Fisheries Development Foundation (AFDF) visit http://www.afdf.org and for more information about the Symphony, visit http://www.afdf.org/symphony-of-seafood/. Alaskan Leader Seafoods is the most progressive, innovative and vertically integrated hook and line fishing company in Alaska. The company is still 50% owned by the original seven fishing families who founded the company over 25 years ago. Its vessels are the newest and the cleanest in the fleet and maintained so well the company is proud to fly the Maltese Falcon Cross, the symbol of inspection excellence from the American Bureau of Shipping. All the vessels are American built; U.S. Coast Guard inspected and licensed. The sustainable hook and line fishery is applauded by several conservation organizations including the Monterey Bay Aquarium’s Seafood Watch and The Environmental Defense Fund as the most eco-friendly fishing method existing today. Each and every product that carries the “Alaskan Leader Seafoods” brand ensures that it is harvested responsibly, carefully processed and guaranteed as a 100 percent USA product. For more information visit the website at http://www.alaskanleaderseafoods.com.